My terror of hippos had subsided and the nightmares stopped. I heard stories of people who had fatal or near fatal encounters. I even knew a well-known lady in Maun who nearly lost her life and managed to save her leg over a surprise encounter with a hippo. Several years went by and I went in a boat or Mokoro (small dugout canoe) and still had no nightmares. But one day I was with Rebecca, a friend of mine from Spain. I had been to that site many times before and there were always lots of hippo around. This time, as we started out with our guide, who guided us through the flood plains in the mokoro. We were peacefully gliding along the edge of the large pool of water. It was so pristine, and tranquil as the sound of the water gently brushed our ears. 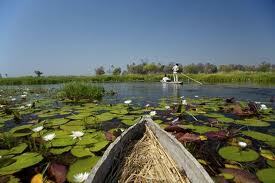 I was glad my friend could see the beauty of the Okavango Delta. The place I had spent over half my life. There were elephants and different species of antelope in the distance. The fish eagles were calling out with their magical sounds. All at once, the grunting of the hippos in the middle of the pool interrupted the tranquility. They began a chorus that sent terror down my spine! I became paralyzed by fear. When we started out, it didn’t seem like there were very many of them. But I started counting and before I knew it I had counted nearly 80 of them! My mind got a little carried away and I started imagining hundreds of them and could almost see them chasing after us in our vulnerable little Makoro. Rebecca noticed that the guide wasn’t a bit concerned about all the commotion. She looked at me, sitting behind her and she could see I was not doing well! I was frozen, white faced (even more white than my already white face!) and couldn’t do anything but pray. Later Rebecca told me that as long as the guide was fine, she was fine. She was a bit surprised at this veteran missionary carrying on like a scared cat in water. Here’s the deal, nothing happened except a raging headache from getting so worked up! The truth is, these guides are brilliant in their knowledge and experience in the Delta. It is RARE for anything to go wrong. And it usually isn’t even tourists that are involved. (Generally speaking) So don’t let this stop you from coming to one of the most incredible places on earth! Why all of the sudden, after several years of being over my fear of hippos did it come back like this? Often in our lives, we grow in areas where there are weaknesses only to find we are dealing with the very same thing again and again. I had to go back in remember that it was facing my fear that finally stopped the nightmares and near heart attacks when I got close to a hippo. Life will bring many opportunities to shrink back just enough to keep you from being all you can be, just enough to stop you from making a difference with your life. There will always be opportunities to give up, to freeze up, to become paralyzed by fear. I want to encourage you to stay in the boat! Steady the course and let God help you overcome those fears that hold you back in life.